Dark Horse Comics is producing a new product call 'Pop Out People'. This people pop out of a cardboard strip, and can be stood in front of the supplied cardboard back drops. So far, the have a Simpsons, Futurama, and Buffy the Vampire set - I know they have additional Simpsons and Futurama sets planned, along with other properties like the Planet of the Apes. At around three bucks, they aren't too hard on the wallet. The characters themselves are all straight from the book, although it's clear they are still using the same color masters as 10 years ago. 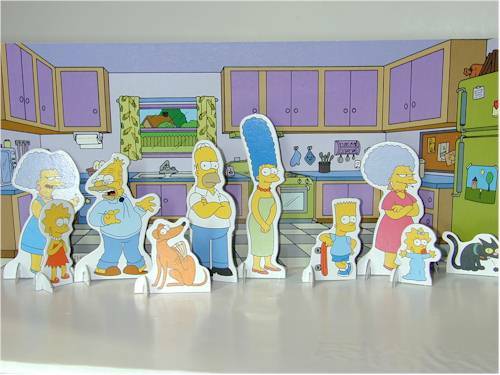 The cardboard background is two sided - the Simpsons set comes with the Kitchen and Living Room. 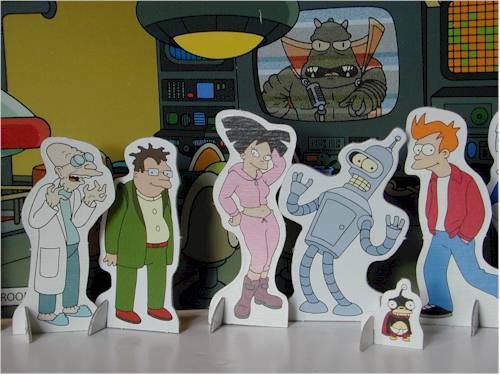 The Futurama set comes with a city scene, and the interior of 'war room'. The graphics on the backgrounds are excellent, extremely detailed and well rendered. I have plans to scan them, and resize them for other purposes as well. The first installment of OFF comes with Homer, Marge, Bart, Lisa, Maggie, Santa's Little Helper, Snowball II, Grampa, Patty and Selma. 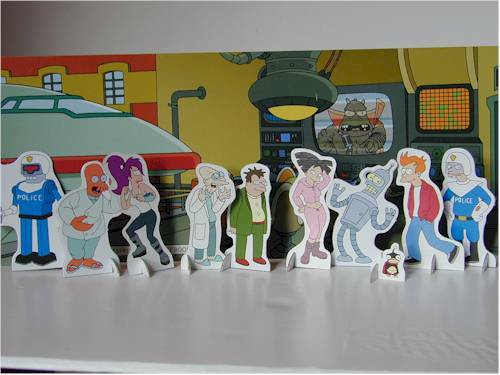 The first Futurama set includes Leela, Zoidberg, Bender, Nibbler, Fry, Amy, Hermes, Farnsworth and the two cops, URL and Smitty. 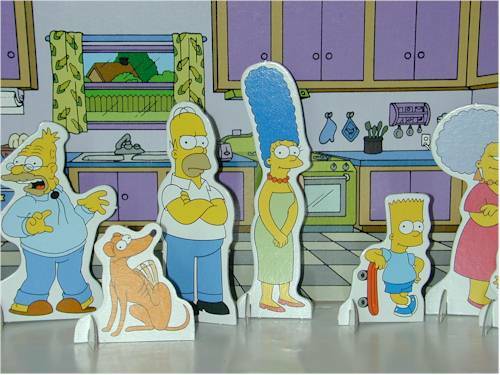 The Simpsons set seems pretty straight forward, and they are all family members. It's the most intelligent choice for the first set, and since subsequent sets will be themed around specific episodes, I'm sure we'll get plenty of unique characters. The Futurama set makes sense up to the cops. They wouldn't have been my first choice. Instead, perhaps Brannigan and Kif. Clearly though, the Futurama world doesn't have the number of possibilities that OFF does. These really are a great value, available for less than three bucks at most places. Considering that you get a great little display piece, with ten characters and two backgrounds, it's certainly worth the cost. They lose a couple points here. Unfortunately, the small cardboard cross pieces that are used to stand the figures don't fit very tightly. Therefore, the figures tend to fall over, and when then do the small cross pieces come out. They also fall out whenever you pick them up, so moving them around is more of a hassle than it needs to be. There are two cross pieces for the backgrounds, and I suspect that this will prove one too few over time. A third right at the center would have been a superior design. The only knock here is in the loose fitting cross pieces - otherwise these really are excellent items. With episode based sets, like the Stonecutters, coming out soon, I have think these are a great addition to any Simpsons collection.